On the road or at the job site, you're concerned with one thing - getting your work done on time and on budget. But did you know that something as simple as a burned out brake light or dimmed license plate lamp can jeopardize that goal? In 2014 alone, state inspectors nationwide issued nearly 1,000,000 lighting-related violations, for everything from broken turn signals to missing reflectors. And each violation affects Compliance, Safety, Accountability (CSA) scores - from 2 points for a broken marker and 3 points for damaged reflectors, all the way up to 6 points for a broken or missing light. Although lighting is one of the most common vehicle inspection violations, it's also one of the easiest to control. 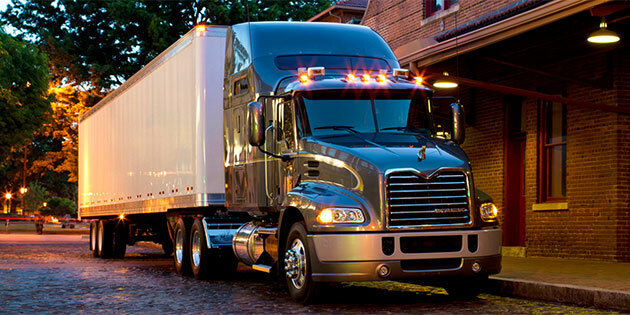 Detailed pre- and post-trip inspections are the best way to keep your Mack® truck on the road for the long haul. Don't just “check lighting,” though. Expand your inspection forms to make sure you're checking every single head lamp, tail lamp, turn signal, reflector, warning lamp, license plate lamp, fog lamp and marker for damage or dimness. If you've got a light that needs replacing, think carefully before swapping it out. Replacement lights are available at every price point, but saving a few dollars now may cost you hundreds in fines and unexpected downtime later. Choose sealed beams - When contaminants such as water, dirt or salt enter a lamp housing, they create an electrical path that can quickly lead to corrosion and premature bulb failure. Sealed beams keep contaminants out, minimizing corrosion and increasing a light's lifespan. Look for vibration resistance - Whether your truck experiences constant vibration from cross-country hauls or violent jolts from cargo loading/unloading, these shocks can cause bulbs to prematurely break. Choose a lamp designed with special shock resistors that cradle the bulb and absorb harmful vibrations. Upgrade to LED - LED lights use hundreds or thousands of diodes emitting light at the same time to create a smoother, brighter and longer-lasting light than traditional incandescent bulbs. They're also more rugged, more resistant to shock and vibration, require less electricity to run and operate at a lower temperature. LED lights do have a higher upfront cost, but when properly maintained they can last 10 years or longer. Your local Mack dealer can help you find the best replacement lights, markers, fuses and roadside repair kits for your specific application, including value-priced Road Choice™ lights. Call today to learn more or to schedule a preventive maintenance inspection. You can also order replacement lighting products through the SELECT Part Store™. Log on today to learn more about our monthly discounts on popular parts and shop supplies.